1 ⚛ We deploy our WebHelp on the local PC. It won't work in Microsoft IE10/11/Edge browser (but works on the web). 2 ⚛ "sync toc" link displays a popup "Operation Failed! Cross frame communication is blocked..."
Here are typical problems WebHelp authors may run into. ⚛ We deploy our WebHelp on the local PC. It won't work in Microsoft IE10/11/Edge browser (but works on the web). Try using the Mark of the Web (MOTW) in all html files installed locally. Also please try the latest version of FAR HTML 5. ⚛ "sync toc" link displays a popup "Operation Failed! 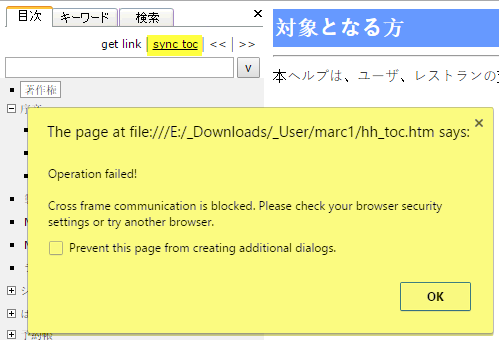 Cross frame communication is blocked..."
Thus when "sync toc" is clicked the TOC frame can't get the URL of the right frame. This typically happens running Google Chrome on the local PC or USB drive. To get around this situation each topic file can include our NavScript.js file (available with FAR 5.7 later). Before adding check for any existing charset statements. Future FAR releases will add this to the Nav files for you. Either a local cache or server cache is hanging onto an old file image. Hit F5 a few times to refresh. For most browsers Shift+F5 or Ctrl+F5 will refresh files skipping cached files. Alternatively there are special header meta statements you can try adding to the nav files that tell the browser to bypass the cache. Tell browser not to cache this file. Useful during development stage when files change a lot. For MS Internet Explorer (not Edge) there are Internet Settings that control both iFrames and Cross-Frame communications. Click Security Tab > Internet Zone > Custom Level button. Enable IFrames & Cross Domain operations. In IE11 iframes are not supported in the Internet zone by default. Rob: Not sure why this worked for Winfried and others having problems with content not showing in IFrames. It may have been an early version of IE11 browser causing the problem. At any rate it fix the problem. The statement basically tells IE11 to run in IE11 mode. So why does it work? Add an icon to the frame host HTML page. The icon is often used in the browser tab and bookmark. See w3Schools for more info. This extra header code is added by default when generating FAR uncompressed help. In FAR 5.8 (813) and later the "Uncompressed help > Frame tab" allows you to tweak this header text.